Well, it has been an interesting, to say the least, three months. After returning from Canada we had a couple commitments to fulfill, then time on the schedule to see our spread out family. The first event was Overland Expo East, held at the Biltmore Estate this year. If you aren’t familiar with this it is the world’s most unique event for do-it-yourself adventure enthusiasts, with classes, films, demonstrations, discussions, all gear to 4-wheel drive and adventure motorcycling. This event is hosted by Jonathan and Roseann Hanson and is held twice a year, once in the west, near Flagstaff, and this event in the east. To start off the event was a Cool Ride contest held at the Wedge Brewing Company in Asheville. You entered you ride and by popular vote it got narrowed down to 8 finalist, all competing for the $500 prize, plus bragging rights. We came in first of the four final motorcycles but lost to 4-wheeler. It was a fun night seeing good friends, meeting new friends and sharing some of the incredible brew from the Wedge Brewing Company http://www.wedgebrewing.com , hope to see you again next year. The OX is held behind the Biltmore in a huge field and they put the motorcycle camping area in a location at the very back of the event, nice because we were all alone, with “Positional Authority”, you had to be there, or ask Cyan, Alain or Alison for more info. We ended up with many friends at the campsite, and although there was a fire ban on we succeeded in our own type of campfire, telling stories from the road, and ended with the tradition circle of friends around the “campfire”. From there we found a campsite in the north Georgia mountains where we based ourselves, spending time between Our son Dallas’s, in Ringgold, Ga, our son Rick’s, in Dallas, GA, and my Mom, sister Laurie and brother Barry, who in Port Orange, FL. We visited, drank, played cards, babysit, went to Disney World and just had a fantastic time. Finally it was time to head to Mexico. 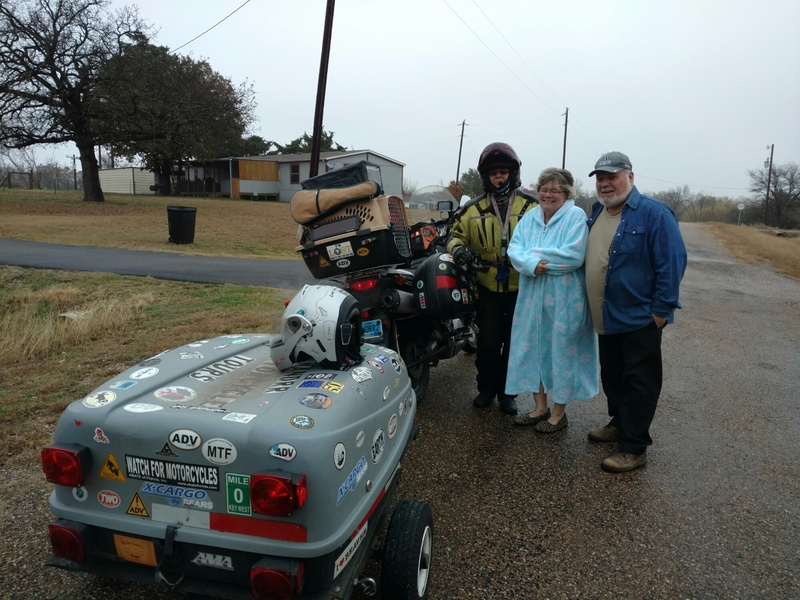 We left the LT in storage with the truck in Ft. Worth with Melanie’s sister, Sharon and headed south trying to beat a quickly arriving cold front. 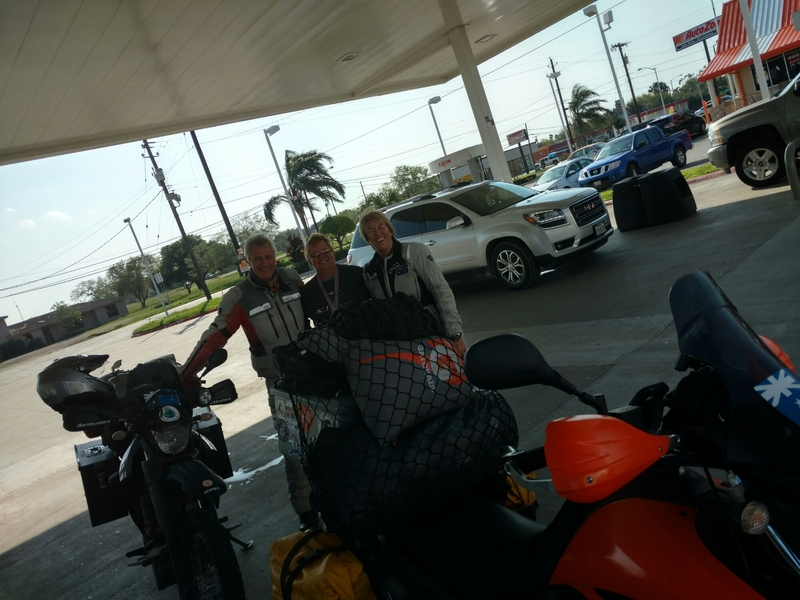 We headed toward South Padre Island to see some friends from Australia, Lynette Williams and Alan Curtis, http://www.twoxtw.com , who are on their RTW adventure. They have been on the road over 2 years now. Funny story getting to SPI. There happened to be a wind from the south at about 20-25 knots, directly in our face. This reduced my gas mileage to the point I knew I wouldn’t make the next fuel stop, 60 miles between. I stopped and poured in my can of fuel for my stove but the wind blew some on the tank of my bike. We took off again and ran out of gas, 1 mile from the pull-off to the station. I stuck out my thumb and got picked up by a couple Hispanic kids who took me to the station, waited and took me back to the bike. As we were filling up the bike we decided to eat a couple of pieces of our left over pizza. Standing there in the middle of a bite I see two bikes, obviously on a big trip, pull into the station. It was our friends from Australia, small world. 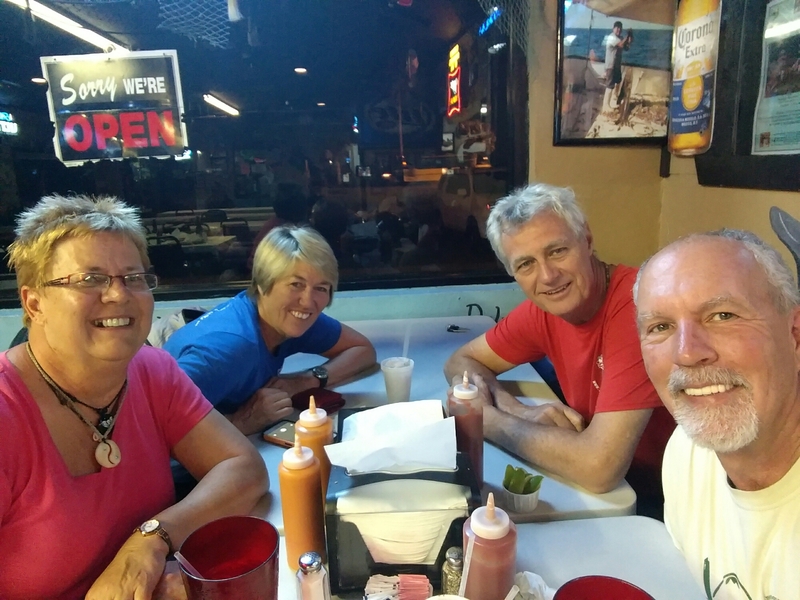 We ended up having a wonderful evening chatting, drinking and eating seafood at a little joint called Dirty Al’s. In the morning, as we were packing to leave to cross the border into Mexico it became apparent that the weather was quickly deteriorating, with winds at about 35 knots and gusts at 50+. We were advised against crossing the bridge as it was deemed entirely too treacherous. within the next two hours the temperature had dropped about 25 degrees so we postponed our crossing until tomorrow, and instead will enjoy a Scotch and some more stories from Australia. As Simon Thomas would say, “Chin-Chin”. Some great adventures! Great kids to pick you up when you ran out of fuel. Nice read. Love following your adventures. Doing some catching up on your older posts and wondered what the term “bid trip” means?? Big trip makes more sense, but I have to confess “bid” trip sounded quite fascinating.